Nothing cheers up a room like a new coat of paint, but it is important to keep in mind that paint can release harmful chemicals into the air you and your family breathe. Many of these chemicals have been shown to have detrimental effects on health. Luckily, we have come a long way since the days of lead-based paints, and more manufacturers are coming out with products that are both safer for human health and better for the environment. 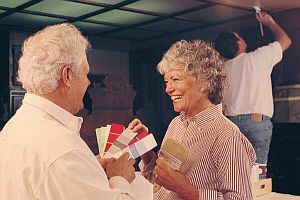 That said, there are still a few things you should keep in mind while working on any painting project so that you can give your living space a fresh new look while also reducing your risk of exposure to harmful pollutants. There are two different types of paint on the market today: water-based paints and solvent-based paints. Most of the paints used for residential painting are water-based, which helps to reduce the amount of VOCs (volatile organic compounds) that are given off. VOCs are solvents that are released into the air as paint dries, which in the short-term can cause headaches and dizziness, and which are suspected carcinogens. Solvent-based paints (also called oil-based paints) are what had been traditionally used to paint homes before the advent of improved water-based paints. The coverage of solvent-based paints was better and longer-lasting, but this is no longer necessarily the case. In addition, solvent-based paints not only contain more harmful chemicals such as benzene, but they are also highly flammable. Although the US government requires that all paint have VOC levels no higher than 380 grams per liter (g/l) for most finishes, some manufacturers have voluntarily developed paint with much lower levels of VOCs. According to Consumer Reports, these include Glidden Evermore, Benjamin Moore Aura and True Value Easy Care paints, which have a VOC of 50 g/l. There have also been a few paints developed that claim to have zero VOCs, which include Mythic and Home Depot’s Freshaire Choice, which has earned the Greenguard Environmental Institute’s seal of approval. However, even these were shown to contain some level of VOCs when tested by Consumer Reports. Before you begin painting, you should be sure to have the proper equipment. Invest in gloves, safety glasses or goggles and a dust mask, and be sure to wear sturdy, non-slip shoes when painting. If possible, paint the room a month before you plan to use it, since most VOCs will have evaporated by that time. Also, it is best to paint in the warmer and drier months when all windows can be fully open and lower levels of humidity will allow the paint to dry faster. The room should be as well-ventilated as possible while you are painting. Keep all doors and windows open, and if possible, mount a box fan in the window (facing outwards) to draw out fumes from the room. Any cross-ventilation you can create is useful. Take frequent breaks for fresh air, and stop painting if you develop a headache, watering eyes, dizziness or problems breathing. Children and people who have breathing problems should never be allowed in a freshly-painted room. By taking these few extra precautions, you can safely enjoy the pleasures of your newly-painted home.